With a sleek design comprised of clean lines, this handsome contemporary style dining table and chair set is the perfect set for any modern dining space. Showing of a surfaced oak finish on the table top that is complemented perfectly by a concrete pedestal base. An 18" table leaf allows you to extend the table for larger hosting occasions making the table the ideal fit for any need. Upholstered dining side chairs complete the modern look while also providing a comfortable place to dine. The Vega Vega Table and Chair Set with 18" Table Leaf by Alf Italia at Stoney Creek Furniture in the Toronto, Hamilton, Vaughan, Stoney Creek, Ontario area. Product availability may vary. Contact us for the most current availability on this product. Make a statement in any room in your home with the handsome and bold modern style provided by the pieces of the Vega Collection. Each piece creates a sleek silhouette through the use of vertical and horizontal lines. 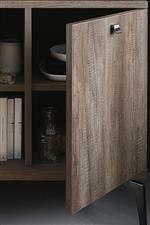 The surfaced oak finish used throughout the collection adds to the sleek design of each piece with a glossy look. The Vega collection is a great option if you are looking for furniture in the Toronto, Hamilton, Vaughan, Stoney Creek, Ontario area. Browse other items in the Vega collection from Stoney Creek Furniture in the Toronto, Hamilton, Vaughan, Stoney Creek, Ontario area.